Great Activities for Kids in the "Kid's Corner"
Take this exciting tour and witness Gray whales swimming and playing in the waters off the coast of Cabo San Lucas. The whales arrive in this area beginning in December to mate and breed in the warm waters of the southern Pacific. You can see the whales playing, swimming with their young calves and interacting in groups before they begin their long trek back to the icy arctic waters in April. 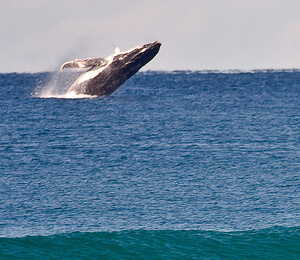 Whale experts say the best time to watch whales in Cabo is in the earlier part of the day, when the whales are most active. These trips depart at 9:00 in the morning so you have the best opportunity to watch whales breaching, diving, and splashing. We will provide you with a complimentary breakfast to start your morning off right before departing for your whale watching destination. You will be able to have a front row seat to catch sight of whales as they begin their day of surfacing, jumping, and putting on a picturesque show in the water. Your MC and tour guide will entertain you with music and games, accompanied by an open bar with champagne mimosas to make this an incredible journey. I have been to the Bahamas many times, but Cabo Escape Breakfast Whale Watching Cruise is one of my favorite trips! It includes everything that everyone should do here. As a Bahamas veteran, I can say only the best about this experience!